Competency questions are those which focus on particular behaviours or skills you will need to demonstrate in the role. These are usually clearly identified in the person specification and job advert. It is very important that you are specific and use examples which demonstrate your ability to use this competency. Do not talk in broad terms about your performance, how frequently you use the competence or your general approach. The interviewer wants you to illustrate your ability through a single, specific, example. Make sure you have some scenarios at your fingertips, having prepared specific examples in advance for all the key competencies which are relevant to the job. Don’t rely on being able to think of something on the day. Choose your scenarios carefully. Use situations where you demonstrated higher level skills and that represented a challenge rather than day-to-day or trivial examples. And make sure that you refer to situations which had a positive outcome, unless expressly asked about situations which did not end well. First, explain briefly the SITUATION in which you found yourself, so the interviewer can understand the context. Keep this brief and to the point. Next, explain the TASK you were assigned to do or your objective in this activity. Then, explain step by step what ACTIONS you took. Be as specific as possible and explain how you went about tackling the activity. Mention what decisions you took and why, what you said to others and how you went about things in ways which demonstrate the competency sought. This should be the main body of your answer as it where you will convey the evidence that you do indeed possess this competency. Briefly explain the RESULTS of your actions i.e. a positive outcome. If you can quantify the outcome, even better, but you can also give qualitative outcomes such as feedback from clients and managers. Finally, EVALUATE briefly how you dealt with the task by saying what you learnt and what you would do differently each time. Ensure that you talk about your personal role in performing this activity. Avoid using ‘we’ as it is difficult for the employer to evaluate your contribution. Use the opportunity to demonstrate other relevant competences at the same time. 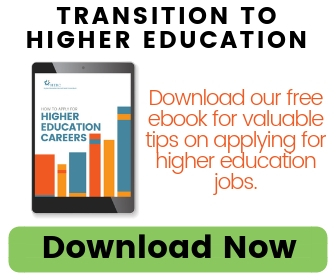 This article was provided by HERC Trustee Partner Jobs.ac.uk. As the leading International job board for careers in research, science and academia, jobs.ac.uk can help you access, attract and engage with the best faculty talent from around the world, whilst providing a time- and cost-effective solution for optimizing your institution’s recruitment. Thinking about your next career move? Check out our latest job postings or create a free account to save job searches, upload your resume, and get daily job alerts. © 2000 – 2019 The Higher Education Recruitment Consortium is a project of the Tides Center, a 501 (c)3 non-profit organization.